Don’t let the variety of options floor you! Find out which wood surface will look best and wear longest underfoot—at a price you can afford! One of the oldest flooring materials is still among the most desirable. Whether your style is classic, contemporary, or eclectic, a hardwood surface can complement your décor and add value to your home. Durable, natural, and renewable, hardwood flooring is available in a variety of colors and grain patterns to suit your individual design and lifestyle needs. Five hardwood species (oak, walnut, hickory, maple, and cherry) are among the most common choices for residential flooring and each has its own properties. But before you select a species, you should understand the pros and cons of both types of hardwood flooring—solid and engineered—and consider finishing options, too. Read on for everything you need to know so you’ll wind up with the finest flooring for you! 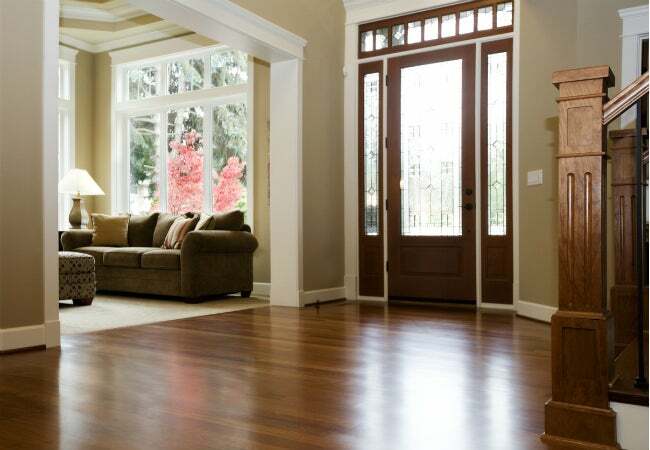 Traditional hardwood floors feature solid wood boards while engineered hardwood flooring offers the look of the real thing with increased application options at a slightly lower cost. Solid hardwood flooring boards are milled from a single piece of wood, while engineered hardwood boards feature a multi-layer base topped with a layer of real hardwood. Prefinished solid red oak flooring runs about $5 per sq. ft., while engineered red oak flooring runs $1 to $2 less (the thicker the hardwood layer, the higher the cost). Price aside, consider the benefits and drawbacks of both. …can be refinished many times, and so has the potential to last for decades. …is designed for installation over a wood subfloor, with each board positioned and individually nailed to the subfloor. Since it requires nailing, it’s not suitable for installation on a concrete substrate. …is not recommended for below-grade installations, such as basements. The increased humidity and residual moisture below grade can lead solid hardwood to warp. …can develop “cupping” if exposed to high humidity. Because each board is nailed on the edges, if the wood swells, the boards press on one another and they can push upward slightly at the seams, creating a cupped depression along the center of the board. …can develop gaps if the wood contracts. If the moisture level in the wood was higher when it was installed, gaps between the seams can occur as the wood dries and shrinks. To prevent gaps, allow boards to acclimate to the room climate for at least two weeks before installation. …is made of multiple thin layers of compressed wood, resin, and polymers, and then topped with a layer of real hardwood. …can be installed over a host of different flooring, including wood, tile, or linoleum as long as the existing floor is level, and can even be installed concrete. Instead of being nailed to the subfloor, engineered flooring planks are fitted and snapped together via grooves on the sides of the planks. A “floating floor,” it’s not physically attached to the floor beneath. …can often be installed in basements. The resins and polymers in engineered flooring withstand higher humidity. Check the individual brands, however, because resistance to moisture can vary. …can sometimes be refinished. A few manufacturers that use a thicker layer of surface hardwood claim that their product can be refinished once or twice. The majority of engineered hardwood flooring will not hold up to refinishing. …will not cup or cause gaps between seams. An engineered floor is installed with an expansion space around its perimeter. It’s less likely to swell or contract, but even if it does, the expansion space will accommodate the movement and the floor will remain flat and level. …comes prefinished; once it’s installed, nothing more is required. Until recently, solid hardwood flooring was installed unfinished, and then the installer would apply stain and a durable finish coat to protect the surface. Today, hardwood flooring is also available in a prefinished product, with stain and topcoat already in place. …is the smoothest flooring option. Because it’s installed and then sanded, there’s no board-height discrepancy. …allows for custom colors. If you want a unique shade, install unfinished flooring and have the stain custom-mixed at a paint store. …is more time-consuming to install. Since the floor is finished in phases—installation, sanding, staining, finishing—it can take three or more days to complete. …entails mess and potentially toxic fumes. 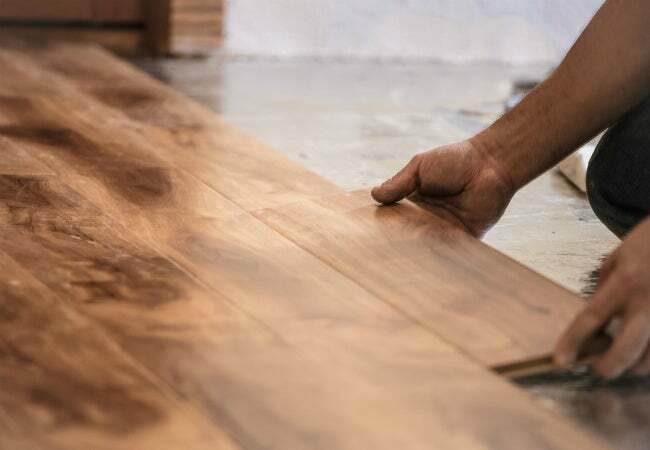 Sanding an entire floor is a dusty prospect, and some stain and finish products produce disagreeable fumes that require ventilation during application. …means lower material costs. On average, unfinished hardwood flooring runs about $1 per sq. ft. less than prefinished. For example, unfinished Red Oak flooring runs about $4 per sq. ft. while prefinished Red Oak runs about $5 per sq. ft.
…but higher installation costs. The extra labor required to stain and finish the floor makes unfinished hardwood more expensive when professionally installed. Depending on labor costs in your area, you may end up paying more for a flooring pro to install and finish the floor than you would to have a prefinished floor installed. A professional installer may stand behind defects in workmanship during the application and finishing process, but if you install the floor yourself, you won’t have any recourse if the finish doesn’t hold up to normal wear and tear. …is available in a few dozen colors, but cannot be customized in your shade of choice. 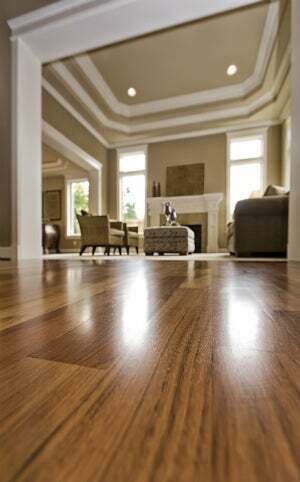 …has higher initial material costs but lower installation costs than unfinished types of hardwood flooring. Since no staining and finishing are necessary, a professionally installed prefinished hardwood floor is often less expensive than a professionally installed unfinished hardwood floor. In the long run, you’ll probably pay less for a prefinished hardwood floor. …has no exposure to dust or toxic fumes. …comes with manufacturer warranties that often guarantee against defects in stain and finish coat. Now that you know the score on floors, you can begin to choose your species, based on color tones, wood grain patterns, and overall durability. The Janka Hardness Scale, named for Gabriel Janka, an Austrian researcher who developed the scale in 1906, is today’s industry standard for determining wood hardness. The higher the rating number, the harder the wood—and the more durable your floor. • Oak: This popular hardwood features two distinct types, both highly desirable for flooring options. • Red Oak: The most common hardwood flooring choice available today, it has a Janka rating of 1290 and is well suited for most flooring needs. Its warm tones range in color from creamy pink and golden red to rusty brown. It features graceful swirled grain patterns throughout and has a tendency to vary slightly in color and grain pattern from one board to the next. Red oak complements diverse décor styles, including classic, rustic, contemporary, and country. • White Oak: Chosen for its fine grain patterns and cool hues, white oak is harder than red oak, coming in at 1360 on the Janka scale—making it a good choice for high traffic areas. White oak has gray undertones and no hint of red. Its grain and color vary only slightly, producing an overall floor effect of smooth elegance, which is suitable for many design styles. • Cherry: Prized for its warm brown hues and smooth grain pattern, cherry is slightly softer than some hardwoods, ranking 950 on the Janka scale—so best for lower-traffic spots, such as bedrooms and formal dining rooms. Cherry has a tendency to darken slightly over time, especially if exposed to bright sunlight. For optimal visual impact, consider installing wide flooring planks—up to 8 inches—to showcase this hardwood’s beautiful grain pattern. • Walnut: Its deep, rich, chocolate tones and large straight grain patterns make walnut a top choice for drama and sophistication. With a Janka rating of 1010, Walnut is suitable for medium-to-light traffic, but may show wear in high-traffic areas after a few years. Color variations from board to board are slight, giving walnut floors a smooth, consistent look. • Hickory: With a Janka rating of 1820, hickory is very durable, ideal for high-traffic zones—in fact, it was once a top choice for school gymnasium floors. Hickory features mocha-tones, ranging from creamy beige with a hint of red to warm brown with dark brown streaks. With large knots and color that can vary substantially from board to board, hickory is well suited to rustic and country style. • Maple: Another highly durable choice, maple ranks 1450 on the Janka scale and is suitable for most rooms. It’s a fairly light-colored wood, with hues that include light cream, beige, and tan, and it often features a slight reddish tint. Maple has a fine grain pattern, with occasional dark streaks and specks that add visual interest to the wood. This hardwood complements many styles, including contemporary, transitional, and eclectic.